Note: The November 14, 2011 SPAC meeting was held concurrently with the final Roxhill skatepark design meeting at the Southwest Library and no minutes were taken. There was no SPAC meeting in January 2012. Kelly Davidson provided the following update via email: I have sent the SPAC bullet list of suggested alterations to California Skateparks and I plan to have a phone meeting them to discuss what may be feasible within the current footprint and budget. We expect 65% construction documents to be reviewed in the next couple of weeks. Discussion ensued regarding general dissatisfaction with the existing skatepark design and potential remediations. Ryan noted that a number of features could be changed in subtle ways to improve the overall flow of the park, including small modifications to various transition and street features. Susan noted that site issues have introduced additional complexity to the process. Matt asked if there is an internal review process for vendors in the Parks system, and noted that a post mortem discussion of this skatepark project would be desirable upon completion. Ryan reiterated the SPAC’s initial concerns with the Rob Dyrdek Foundation donation to this skatepark project and California Skateparks’ designation as its sole source vendor, noting that a similar letter to the City will be in order at this time. Additional discussion ensued regarding the lack of a final design at the final public design meeting, and the need to document this fact for the sake of future skateparks. Kelly Davidson provided the following update via email: 65% Construction Documents have been approved. Permit intake meeting will take place next week and project is expected to bid in May and start construction in July. This project should have begun construction this month, and has been plagued by delays. Ryan requested follow-up by Susan with Patrick Donohue. Additional discussion ensued regarding the inadequate status of lighting at Jefferson, the need for communication about this with Patrick to ensure that a quality lighting solution is achieved at Hubbard Homestead. Morris Wainwright recently attended a lighting meeting on behalf of the SPAC with the lighting consultant and Kim Baldwin. At this time, it appears that there is no consistent standard for skatepark lighting solutions, both locally and beyond Seattle. Discussion ensued regarding the details of various shadows at Jefferson, the level of light required at this skatepark, the lack of LED lights that were originally expected, and the quality of service being provided by this consultant. Other than the lighting issue, the new skatepark is great and often packed with skaters. The grand opening for Crown Hill Park will occur on May 19th. Skate Like a Girl (SLAG) and Youth Employment Skateboarding (YES) will be presenting the first in a series of skate clinics at this location in March, initially to the staff of the Small Faces Child Development Center. Despite a full, levy-funded public process, and a complete design review process, the bids for this skatedot are too high and there is not enough money in the budget to build the skate feature. It appears that there is something changing in the construction business as well, given that the low bid was $9K and the high bid was $40K. Construction of the park will begin in May. Discussion ensued regarding getting some money into this project before May in order to build this feature. If there are savings from Roxhill, these funds might be available for Kirke. Ryan to follow up with Kelly Davidson regarding the feasibility of this idea. Discussion about the lighting issue occurred, including a NMF grant, and bundling lights with the larger sports field improvement project currently slated to occur within the next 5 years. Susan reported that Seattle has partnered with SLAG to apply for a $100K Innovations in American Government grant to extend services currently offered by YES. Discussion ensued regarding permitting for a skatepark clinic series, designated times for skate sessions at parks, excluding other groups of skaters who are not participating in clinics from public skateparks, size limits to clinics, life skills coaching offered by skate clinics, and the community value of paying teen skaters to be counselors at YES clinics. Additional discussion ensued regarding vendors and commercial interests at skateparks for purposes of promotion, product giveaway, and clinics. Discussion ensued regarding the end of Parks and Green Spaces Levy funding, the recession, the lack of a future funding source for more new skateparks, the Opportunity Fund, the Neighborhood matching fund, maintenance costs, and budget cycle timing. Scott to follow up with Kevin Hilman regarding the next Opportunity Fund round and the Lake City skatedot campaign. Matt noted the need to fund maintenance of the existing skatepark system, and establish a fund for future skatepark maintenance. Discussion ensued regarding this issue, which will become a primary objective of the SPAC in 2012. I just received confirmation that the Seattle Conservation Corps will take on all preparation for the slab on the interior of the curved benches. They have their own funding source to cover that portion of the work. I will need to find funding to have the concrete poured and finished and to fabricate the pole jam and steel bench. I’m expecting to use the remaining $2,500 toward this and I will need to see where else I can come up with some funds. The meeting adjourned at 7:25. The next SPAC meeting will occur on Monday, April 9, 2012, 6PM, 100 Dexter Ave.
Joe reviewed the details of the conceptual drawings derived from the first public meeting. Discussion ensued regarding various details of the skatespot, including the pre-made elements from the Rob Dyrdek Street League contest, plaza area, landscape details, benches, proposed snake run, open space and drip lines of adjacent trees and possible dead end with quarterpipe, bank, or storage area. Micah reviewed the details of the Benefit Park skatedot project, including the current site conditions, existing playground features that will be converted into skateable features, current user groups in this space, possible addition of an $18K concrete pad adjacent to the existing skate features with donated features, addition of a corner bank, quarterpipe and hip. About thirty kids attended the first two public meetings and this is turning out to be a very enthusiastic community group, with a strong possibility of additional fundraising. This will be a retrofit of an existing park using the skate dot pot. Micah reviewed the details of the 110’ x 110’ site that will support an 8-10K skatespot. Kelly reviewed the extensive details of the WSDOT lease agreement. The site is located on a fill area, which will preclude a deep bowl. The features of the site are inspired by the mountains and the sound. Discussion ensued regarding gathering space, connecting the skatespot to the adjacent park, possible proximity of other parks with snake runs, replacing transition-rich street features with banks, placement of the deathbox, pole jam and flat rail features. Detailed discussion ensued regarding the mountain signature feature, integration with surrounding features, utility of the proposed opposing transition versus a bank feature, possible pyramid hip in one corner of the park. The meeting adjourned at 8:00. The next SPAC meeting will occur on Monday, November 7, 2011, 6PM, 100 Dexter Ave.
Summary of our meeting this week with Seattle Parks regarding the Dyrdek donation. 2. That California Skateparks (the consultant that will be performing the free design for the Dyrdek Foundation) response to the Parks RFQ for design work at Roxhill was ranked last (several other designers also submitted responses) by a diverse design selection committee. 5. That savings in design costs will not be applied back into the skatepark such that the community realizes any benefit from the donation. We elevated this issue to the City Council and head a meeting with the Seattle Parks Superintendent and some of his staff earlier this week to further discuss these concerns and proposed a recommended path forward. Below is a summary email we provided to the Superintendent following the meeting. We will be talking with the City Council regarding the outcome of this meeting. We will provide further updates as this issue progresses. Have a good (dry) weekend and hope to see you out skating. Thanks again for meeting with us yesterday. We just wanted to send a quick note summarizing what we discussed, and re-state our take-away from the meeting in the spirit of complete transparency. * Parks will be moving forward with accepting the donation for the Roxhill project. * Parks is not concerned with the issue of subverting the process that allows for public input on the selection of the designer. * The donation came with strings attached, one of them being that the project needed to be “shovel ready” which essentially forces Parks to apply it to a project that’s already funded and underway. * The SPAC primarily recommends that the donation go to another site identified in the Citywide Skatepark Plan. This would also realize the benefit of Grindline Skateparks (skatepark designer selected for the Judkins skatepark) proposed “two-for-one” donation of designs for both Roxhill and Judkins, which was precluded by the Dyrdek donation. The SPAC understands that this would require additional discussions with the Dyrdek Foundation due to the initial terms of the donation being tied to a “shovel ready” project. The SPAC offers any support necessary with these discussions. * If the SPAC’s primary recommendation cannot be realized, and in order for the Dyrdek donation to support in any way Seattle skateboarders and the Roxhill Skatepark, the SPAC understands that Parks will preserve all existing funds in the $600K Parks and Green Spaces Levy project budget for use at the Roxhill Skatepark or another skatepark funded through the Levy. The SPAC looks forward to discussing with Parks and California Skateparks how best to apply the donation savings to Seattle skateparks prior to initiation of the Roxhill Skatepark design process. Thanks again for meeting with us, and please feel free to let us know if any of this is incorrect. We’re open to input and expect the conversation to continue. Screenshot from the Dyrdek/McGinn press conference. Today we sent a letter to Mayor Mike McGinn and Christopher Williams regarding their lack of outreach to the Seattle skate community before accepting the “donation” from the Dyrdek Foundation, and what we think is going to happen if they go through with it. The SPAC is writing you today to express our concern with Parks continued progress to award California Skateparks a “sole source” design contract for the Roxhill Skatepark, as a result of the donation made by the Dyrdek Foundation. The donation includes free skatepark design services by California Skateparks for the Roxhill Skatepark, which already includes a fully funded design and construction budget based on approval of the Parks For All Levy passed by Seattle voters. The SPAC is very happy that the Parks Superintendent and Mayor have come out so strongly in favor of skateparks as a result of the Dyrdek Foundations donation offer in May 2011. We also feel very fortunate that the Dyrdek Foundation recognized Seattle for being a leader in skatepark planning and funding, and wanted to contribute finances to help further our leadership. However, we are disappointed that neither the Parks Superintendent nor the Mayor made any attempt to consult with the SPAC to evaluate the terms and affects of the donation, especially given the SPAC was the lead stakeholder group responsible for evaluating and lobbying for funding of this skatepark. Although we have supported Parks on skatepark issues for eight years and are clearly the primary stakeholder and resource on these issues, we only learned that the Parks Superintendent and Mayor were going to accept the donation without these necessary consultations and evaluations one day in advance of the donation offer. Had we been consulted, we would have shared with you several concerns based on our knowledge of skatepark issues in this region and nationally. These important concerns are summarized below and identify why the accepted donation, without further evaluation, does not provide a benefit to Seattle or the skaters that will use this skatepark. Our desire is to raise these concerns proactively to attempt to avoid an angry neighborhood and skateboarding community due to the design of a sub-par skatepark. 1. Seattle Parks has an established objective design selection process and this donation undermines that objective process. The unconditional approval of the Dyrdek Foundation design services donation does not allow the above established objective review and rating process to occur. Therefore, Parks and Seattle skateboarders are unable to evaluate California Skateparks passion and creativity, expertise, experience, and demonstrated ability to produce construction documents suitable for public bid. The SPAC spent considerable time and energy lobbying for identification and procurement of funding for this skatepark and find it unacceptable that a donation will eliminate our ability to ensure the best possible designer is chosen for this project. For example, what leverage does Parks and/or the SPAC have to ensure California Skateparks is creative and passionate about making this the best possible skatepark since they are not getting paid for their services? The SPAC urges Parks that this donation, and future similar donations for design services where funding is already procured, be evaluated using the above criteria and that the donation should only be accepted if the consultant exceeds a pre-defined rating threshold. 2. The savings resulting from the donated design services are not guaranteed to result in a better skatepark. During the acceptance of the donation, the Mayor stated that an amount equal to the donation would be removed from the existing funding for the skatepark, and placed back into the Parks For All Levy general fund to support other projects. If this is true, the SPAC is even more concerned that the donation was unconditionally accepted because Seattle is truly not receiving any benefit from the donation, which is unfair due to the substantial amount of work and lobbying completed by advocates, community members, and skateboarders, went into acquiring the existing funding for the project. In addition, if true the Dyrdek Foundation would be very disappointed to learn that their donation did not result in additional skateable terrain or improvements to the already funded Roxhill Skatepark. If the Mayors statement was misspoken and the design savings were maintained for this project, there is no means to identify how much of the savings would result in an improved skatepark because the savings would be directly linked to the construction bids (i.e., if the construction bids are above the engineers estimate for the design, the design savings would be used to cover the construction cost increase). During the initial round of ratings by the Consultant Evaluation Committee appointed by Parks as a part of the selection process for the Roxhill Skatepark, California Skateparks was rated the lowest of all received consultants, with only one vote by any Committee member. The Committee was composed of [Matt enter affiliations here to show wide range of folks]. The SPAC representative that participated in the Committee found that the California Skateparks submission lacked detail, site awareness, and inspiration. These objective evaluations by a wide range of participants (skaters and non-skaters) clearly show that California Skateparks would not be selected as the designer for this skatepark in the absence of the donated services. Therefore, acceptance of this donation results in the selection of a sub-standard design consultant and associated design. 4. In exchange for the donation we are relinquishing a considerable amount of control and input on what kind of skatepark goes into this site. The Roxhill Skatepark requires a custom design due to the site’s unique restrictions. The SPAC has researched California Skatepark designs throughout the country and feels that they are not a good fit for this unique site because they generally design skateparks with large, contiguous footprints and limited site constraints. The Roxhill Skatepark site is dotted with mature trees, and therefore requires a non-contiguous design that incorporates these trees. A California Skateparks street plaza in this site would require the removal of many if not all of these trees. The SPAC does not support the removal of trees to build skateparks. At this site, the SPAC advocates for other contemporary skatepark designers that have a documented portfolio that includes the integration of creative designs with existing trees. California Skateparks does not design or build the kind of skatepark that will work best at this site. 5. It’s not clear that the skateboarders will realize any benefit from this donation. The SPAC would like to emphasize that this skatepark project is fully funded so a donation is not necessary/warranted for this project unless there is a clearly identified benefit to be gained by the donation. We are unable to identify sufficient benefits to outweigh the above identified concerns. In exchange for accepting this donation on our behalf without consulting us first, we are being forced to select the lowest rated design consultant (by Parks own selection process), with an increased risk of building a sup-par skatepark for the site or the community that will be using it. Again, the SPAC appreciates the supportive spirit behind the Mayor’s and Parks Superintendent acceptance of the donation. However, we hope that the concerns raised above will lead to rejection of the donation and the selection of the best designer identified by the Parks appointed Consultant Selection Committee. No skatedot? Back into the street kids! One thing is for sure, if you threaten to take away a skatespot, the people show up. Last night the NIMBY showing was strong, and frankly, their testimony was compelling. One woman who pounded on the podium to make her point about irritating noise coming from the skatedot, was pretty rad (even though she totally misappropriated my words). Honestly, I don’t begrudge these people thier right to peace and quiet either, I just think they’re looking for water in a desert. If sound is your issue, frankly, there are bigger fish to fry in that neighborhood. But Seattle skaters showed up! Congrats to 35th/Tony, Skate Like a Girl/Nancy, SnoCon/Forrest, Marshall, Steve, and all the other folks who helped to get the word out. 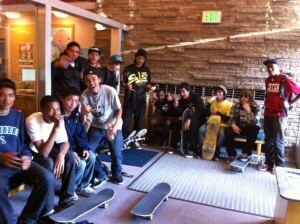 I haven’t seen that many skaters at a meeting in a long time. It really is a battle of two competing and valid needs though. The neighbors’ need for less noise, and the local skateboarders’ need for a safe and accessible place to recreate, of which this is the only one in the area. If I was weighing it out, I would say that the skaters outnumber the immediate neighbors, and the need for access to public spaces outweighs the need for removing only one of many errant sources of noise pollution on that single block. I may not be totally objective, but I am trying to be, and I think the skatedot wins. Access to public spaces is a social justice issue. Noise pollution is an environmental issue. I care about both of them, but I think these tenants should be talking to their landlords about getting some sound blocking windows. Seriously. Two minutes isn’t much time to get a point across, so here are the written versions of testimony from myself and SPAC members Ryan Barth and Scott Shinn. The Parks Board of Commissioners will be taking written testimony until May 20th, and will make their recommendation shortly after that. Greetings Committee members and thank you for this opportunity to speak tonight. My name is Matthew Lee Johnston and I have been serving as a volunteer skatepark advocate in Seattle since 2004. In 2004 I authored a concept paper entitled “The Skateable City” which was eventually adopted as a part of the citywide skatepark plan in 2007. While it took a lot of work from many people to get my concept turned into policy, I guess you could say that I am the “father” of the Seattle Skatedot. The mission of my proposal was to solve a problem. That being that there was a sizable user group in the dense urban core of Seattle, that had no safe and accessible way to participate in their sport. These users have a right to public spaces just like anyone else, and were extremely under-served by Seattle Parks. This user group, many of whom were kids, were forced to enjoy their sport in the unsafe and busy city streets. I didn’t feel comfortable with this, so I tried to come up with a solution. 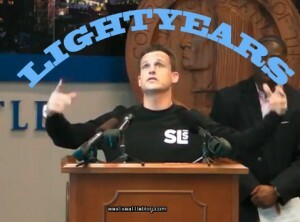 Since then, many other cities have followed Seattle’s lead on skatedots, and pro skater Rob Dyrdek, while standing aside Mayor McGinn and Superintendent Williams, cited the skatedot component as the thing that sets Seattle “lightyears” ahead of every other city he’s visited when it comes to skatepark policy. The reality is that there simply is not room for a traditional contiguous skatepark facility in Capitol Hill. Therefore distributed skatedots like this one are crucial to providing safe area for Seattle skaters. I would like to address the noise issue. I am a trained sound engineer, and I care about noise pollution, and have previously come out in defense of quiet places. This location is not now, and has not been a quiet place for a very long time. In 2004 I performed a sound survey when the Ballard Bowl was under seige in which I documented all of the ambient noise in the environment and recorded the sound pressure levels of each of those sounds. In every case, the skatepark noise was an equal or lesser offender when it came to volume. What I believe is happening here is that the complainants are reacting to a disruptive change in their ambient noise environment. They have unfortunately become used to all of the more obtrusive sources of noise pollution in their environment, and are focusing on this new noise source because it is new, and therefore disruptive. Which is I believe, is discriminatory. The one gentleman who came to the SPAC meeting to express his concern told us that he considers the sirens, late night revelers, car alarms, and city busses all acceptable noises, but that the skateboarding noise simply was not acceptable to him. I believe this proves my point. These folks are effectively pulling the skateboarding noise out of an interwoven cacophony of urban noise, pointing at the skateboarding sound and saying: “I don’t like this one but these are OK”, which to me, is unacceptable as justification for removing a needed public recreation facility for an underserved user group. Please listen to their arguments, be objective as you always are, and make your recommendation. I trust you will be fair. But please remember that skateboarders deserve access to public spaces too, and they are and will continue to be underserved in the urban core until we get more of these skatedots built. Good evening. My name is Scott Shinn and I’ve been advocating for skateparks in Seattle for seven years. During that time, I’ve also served as the Secretary for the Skatepark Advisory Committee, and a member of the Citywide Skatepark Plan Task Force. One of the reasons I keep coming back to this process year after year is the sense that I am witnessing and helping to record an important historical transformation. On behalf of Skaters for Public Skateparks, I also want to invite you to watch the Freedom of Space DVD you received at the beginning of the meeting. For five years, this documentary has provided the best glimpse into the lives of real skateboarders for decisionmakers like you, including Mayor Nickels and members of the City Council. To me, the issue at Summit Slope is not noise or safety, because these are not unique to skateboarding. The issue is that we are finally starting to make public spaces for skateboarding, and this is an important transformation of our urban landscape, and perhaps of our species itself. My name is Ryan Barth and I am the current Chairperson of the Seattle Parks and Recreation (Parks) Skate Park Advisory Committee (SPAC). I have been involved in Seattle skateboarding advocacy since 2004. Since that time I have spent countless volunteer hours working with Parks to attempt to legitimize skateboarding and obtain much needed legal skateboarding terrain for Seattle’s estimated 20,000 skateboarders. Over many years we have constantly searched for a legal suitable location in Capitol Hill, which is one of the most densely populated neighborhoods with the greatest population of Seattle’s estimated 20,000 skateboarders. When we learned of Parks Summit Slope Park redevelopment, I attended the first design meeting and listened to the community’s idea for the park. The meeting was well attended by the community and the input received seemed to mesh well with a small, integrated skateboarding feature so I attended the second design meeting and proposed a skateable element to the community. The community was inquisitive of this proposal and asked the standard questions we typically receive from the community about skateboarding: what about crime, noise, safety, and density of use. I provided information that the SPAC has gathered based on years of evidence from skatepark use throughout this region and nationally. The community listened to my input and no attendees expressed further concern at the meeting. I then attended the third and final design meeting, where Parks presented the community with a design option including a skateable bench. Again, the community responded favorably and none of the attendees expressing concern. Based on this community support and $12,000 dollars of tax payer money, Parks constructed the first legal skatedot in Capitol Hill. The skateboarding community was very excited to have a single safe, legal location to skateboard in the entire eastern portion of downtown Seattle. Following construction, Parks approached the SPAC about concerns raised by surrounding neighbors. The SPAC submitted a Public Disclosure Request to understand these complaints, which primarily consisted of noise and safety concerns by a small group of neighbors who lived directly adjacent to the skatedot. Due to these complaints, Parks consulted with the Seattle Department of Transportation (SDOT) to conduct a safety evaluation. SDOT identified a few measures that could be implemented to increase safety associated with use of the skatedot. Parks implemented the full list of SDOT-recommended measures to a cost of $7,000. Still, the small group of neighbors continued to lodge complaints. With regards to the issue of noise, the SPAC understands that skateboarding creates noise just like any other sport, and this was communicated to the community during the design meetings. A noise study conducted by Soni-Fi at the Ballard Civic Center Park in February 2004 identified that noise created from skateboarding was compliant with the Seattle Department of Planning and Development’s noise ordinance (Seattle Municipal Code subchapter 25.08.400) and often of lower decibels than surrounding ambient noises typical of the urban environment. It is unfortunate that there is a small group of neighbors that are averse to the (new) sound of skateboarding in their environment but it must be recognized that these neighbors personally chose to live in Capitol Hill. This neighborhood is well known to have the highest urban density and is the gathering place for the younger generations in Seattle. With these attributes comes noise – traffic noises, car alarms, sirens, construction noise, and yes, skateboard noise. It is discriminatory to selectively point to one source of that noise spectrum and request it’s removal. So what could have Parks (or the SPAC) done differently? Parks conducted four public meetings and notified the public via flyers for each of these meetings. The meetings were well attended by the community and the attendess unanimously stood behind the integration of a skatedot into the park design, with the understanding that skateboarding would create noise. Following construction, Parks listened to safety concerns raised by the community and implemented safety measures that satisfied SDOT’s safety team. The one remaining issue that is difficult to mitigate is noise but this neighborhood has some of the highest ambient noise levels in all of Seattle. Please do not let a few neighbors who are averse to sharing space with skateboarders (under the guise of safety complaints) and noise common to the environment in which they choose to live shut down this sole legal skatespot in Capitol Hill. Screenshot courtesy of WSB's video coverage of the press conference. Dyrdek’s recognition of Seattle’s skatepark plan is a good thing. Seattle skateboarders, Seattle Parks, and the City Council have been working very hard for many years to make Seattle more skate-friendly. It’s great to have that effort recognized by someone like Rob. Mayor McGinn comes out as in support of skateboarding facilities! On the eve of the hearing regarding the Summit Slope skatedot, this is really great news. This is the first time we’ve heard him talk about skateboarding, and if this kind of thing is what it takes for him to come out in support of safe public skateboarding facilities, then we’ll take it. If you peer into the much-lauded Citywide Skatepark Plan, there are no Seattle Parks logos on the pages, and the line that was left for the then-Mayor’s signature, remains unsigned. This is because McGinn’s predecessor wasn’t behind the plan, and actively campaigned to keep it from happening. He ordered Parks to remove the logos, and refused to endorse it. Mayor McGinn buries this dark chapter in Seattle skateboarding history by coming out in support of the plan (or, rather…Rob’s support of the plan). Thanks Mayor McGinn! No one who worked on the City-wide skateboarding plan, or any skatepark advocates whatsoever, were at the press conference or even mentioned. A few of us were contacted at 1:00pm the day before the press conference, and being adults with jobs, kids, etc… we weren’t able to attend. Rob credits “the city” for the skatepark plan, and skatedots, which really isn’t accurate. The city has turned around and is now very supportive, but it wasn’t always that way. We don’t do this for the credit, but the advocates and skateboarders (or even the people in the Parks Department, or the City Council who worked with us…) who had to push hard for these initiatives probably deserved to be recognized, and weren’t. Which, in turn, made the whole thing feel a bit like a glory grab. Less than 24 hours notice is just plain disrespectful. The Skatepark Advisory Committee was never consulted on where this donation would be best applied. When we surveyed this location during the skatepark plan process, the committee identified some issues with the site. One of them was that there wasn’t a lot of unused space available for a skatepark. Currently the only space large enough that’s not being actively used, is the Northwest corner, which is peppered with some mature trees. Whatever is built in this space is going to need to integrate those trees, because no one in Seattle is going to back tree removal for a skatepark (including the SPAC). Dyrdek’s best plaza designs generally consist of a large, continuous plaza, which simply will not fit at Roxhill. We could’ve raised this issue early, and helped them select a more appropriate location. The fact that the Parks Department’s own advisory council dedicated to skateparks wasn’t consulted on this makes us wonder why we’re here at all. The Roxhill skatepark was already fully funded by the voter-approved Parks For All Levy, and as the Mayor mentions at 9:35 in this video from West Seattle Blog’s coverage of the press conference, the current plan is to repurpose $75K from the existing project budget back into the general fund. If this happens, Seattle skateboarders actually see no benefit from this donation. Rob Dyrdek effectively just made a donation to some other non-skate project. This is something we’re asking Parks to clarify, but I’m having a hard time imagining even Dyrdek getting behind this one. $25K of the donation is actually materials repurposed from the Street League event. This is good for Rob and the Earth because the stuff doesn’t end up in the garbage. Conceptually, this is a good thing. One assumes that without this donation, Mr. Dyrdek would have to eat the expense to dispose of this material, and this gets him off the hook on that. But more importantly, the stuff Rob has presumably already donated, was designed for professional skaters and is literally unskateable by the majority of skateboarders, especially kids. Roxhill is in a neighborhood that houses a ton of kids, and (on last check) very few professional skateboarders. Sure, rails can be cut down, etc… but the act of trying to repurpose these features into the design is an additional design challenge that we wouldn’t have had to face if we weren’t trying to incorporate these existing pieces. Don’t get me wrong, I actually think this is a great thing. If Seattle Parks continues to work with the SPAC on figuring out the answers to some of these questions, this donation will amount to a meaningful benefit to Seattle skateboarders. Unfortunately, due to some apparent timing issues with this all coming from left field at the last minute from the Dyrdek Foundation, and Parks not wanting to include the stakeholders to keep the public messaging machine cleanly oiled, there are now some serious open issues of concern. One thing is for sure, the overt public message is good: The Mayor supports skateparks, Rob Dyrdek supports Seattle’s forward-thinking support of it’s own skateboarders, and by hook or by crook, Roxhill will be getting an awesome skatepark very soon. You are currently browsing the archives for the 'SPAC' category.